Please note: we may send additional short newsletters in the coming months with important Medinfo2013 updates. The Medinfo2013 website has been updated with information on registration fees and deadlines - see http://www.medinfo2013.dk/registration Registration is open. Please check the Medinfo2013 website regularly for news updates, plus IMIA communications channels. Follow @medinfo2013 and @IMIATweets on Twitter; check the Medinfo2013 LinkedIn group, IMIA Facebook page, etc. Delegates from specific countries need a visa to visit Denmark. Please read more on www.medinfo2013.dk and also find the list of the countries from where you need a visa. (Please note that you cannot apply for a visa earlier than three months before expected date of departure from your home country). IOS Press offers a paper copy of the Proceedings to conference participants for the discount price of Euros 99. This will need to be ordered in advance of the event. The IMIA General Assembly (GA) meeting for 2013 will be held on 20 August 2013. Attendance at this meeting is by invitation only. We will send the first formal invitations to the representatives of IMIA Member Societies, Institutional Members, and other GA members by mid May. We ask that all members ensure we have correct email contact information for them. We will have a tight schedule (as normal when the GA is held with Medinfo), and need to complete the meeting in time for the Medinfo2013 opening session. 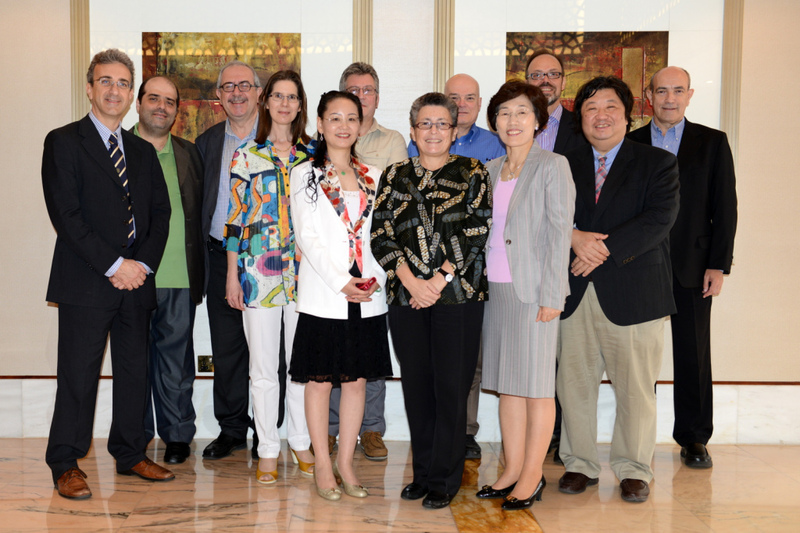 The IMIA Board met in Dubai, UAE on 21 April 2013 in conjunction with the 4th MEAHI conference. Several issues were discussed that will form the basis of important discussion and decisions needed at the 2013 GA meeting; details will be sent to GA members in preparation for that meeting. Two important events take place in Canada in May, 2013. We hope that many IMIA colleagues will be able to participate in and support at least one of them (we know not everyone can get to every event), and we wish the organisers every success. IFHIMA (http://www.ifhima.org/) is an Affiliate Member of IMIA, and IMIA is pleased to be able to participate in the IFHIMA General Assembly meeting to be held on 12 May in conjunction with the Congress. COACH (Canada's Health Informatics Association - www.coachorg.com) will be holding their annual e-Health conference in Ottawa, Canada on 26-29 May (venue the Ottawa Convention Centre). The theme is Accelerating Change, and full details are at www.e-healthconference.com There is a conference blog at www.e-healthconference.com/blog In addition to pre-conference workshops, there will also be the Canadian Telehealth Forum, and plenary sessions on 'Big Data and Quality in Healthcare' and 'The Consumerization of e-Health'. COACH is an IMIA Member Society. HIC 2013 registration is open – the early bird rate closes on 20 May. NI 2014, the 12th International Congress on Nursing Informatics, will be held at the Taipei International Convention Center (very near to Taipei 101) on June 21-25, 2014. The next Medicine 2.0 event will be Medicine 2.0’13 (the 6th World Congress on Social Media, Mobile Apps, and Internet/Web2.0 in Health and Medicine,) to be held in London, UK on 23-24 September, 2013. The venue will be Kensington Town Hall. The event will be in collaboration with the Oxford Internet Institute, University College London, and other partners. See http://www.medicine20congress.com for full information. Registration is open, and a record number of abstracts has been submitted. The 2014 APAMI conference will be hosted by IAMI, the Indian Association for Medical Informatics. Further details in due course. The next MIE (Medical Informatics Europe) will be MIE2014 in Istanbul, Turkey. The dates are 31 August - 03 September, 2014. MIE2015 will be held in Spain.